I have been breaking my head on what to make for the next post, while I had short listed some, none were things that I could do after getting back from home. Thinking of shortlisting the dishes for mini bites I felt I was doing something different and not really deciding on food. I have been talking to myself since morning and both Athamma, Hubby dear thought I have gone out of mind. I must say this BM has been the most unplanned one. Though I mostly cook the previous day I will at least plan what to make and get it ready before dinner, so that we can have what I made before dinner. So making all those other dishes were out of question at 8. 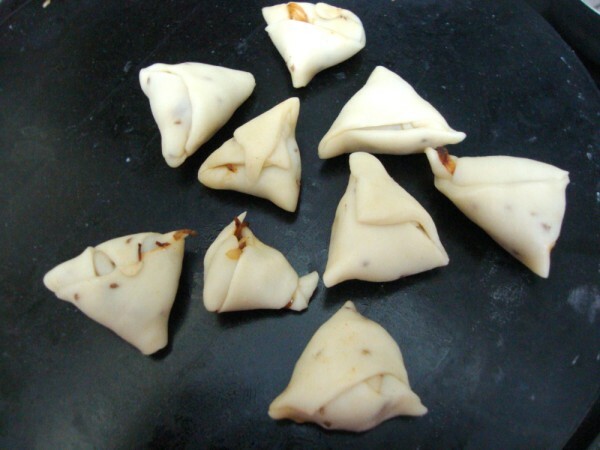 I had this flash thought that I have always been fond of Ajwain samosa but haven’t blogged about it. So mini they will become and they did. Everybody thought I had made more and were sad that I had only some limited numbers. The mini samosas are always great as it controls how many one eats. Everybody liked it so much that I am sure I am going to make these again. In a bowl, take flour, salt, ajwain and ghee, Mix well. 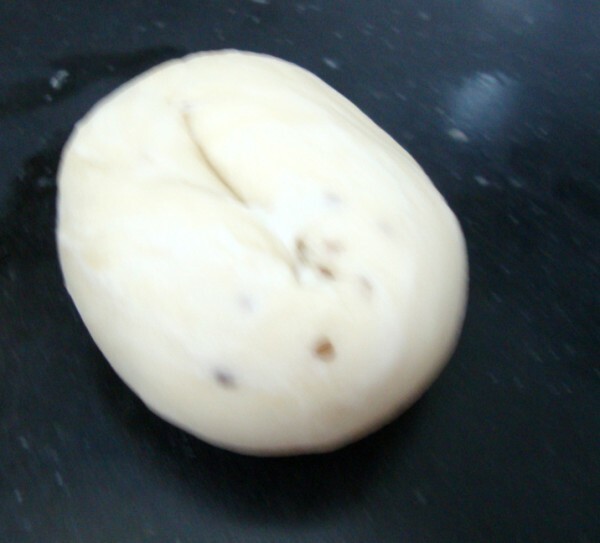 Slowly add water and knead to a stiff dough. Cover with a wet muclin cloth and rest it for 10 mins. To make the roasted onions. In a non stick pan, heat oil saut in onion julinnes. Saute till the onions turn brown. Then add all the spices and combine well. 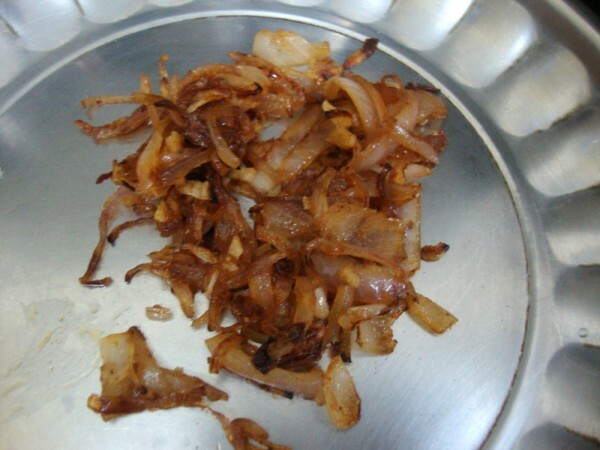 Once the onions are brown and roasted well, remove and allow it to cool. Dust the dough and roll out thin discs. Using a sharp knife cut into 3 inch strips. 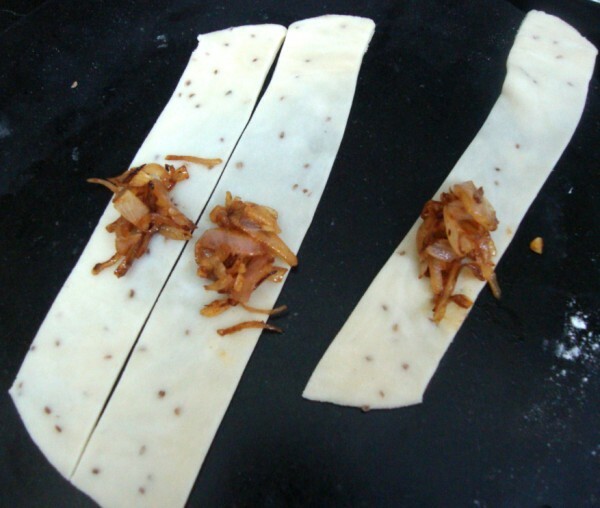 Place a spoon of the onion stuff and roll over diagonally across and cover well. Press the sides and make sure the outer layer covers well. Heat oil in a kadai and gently slide into the oil once it’s hot. Cook over medium flame to get crisp samosas. Sending this to Champa for Kid’s Delight themed one Mini Bites. 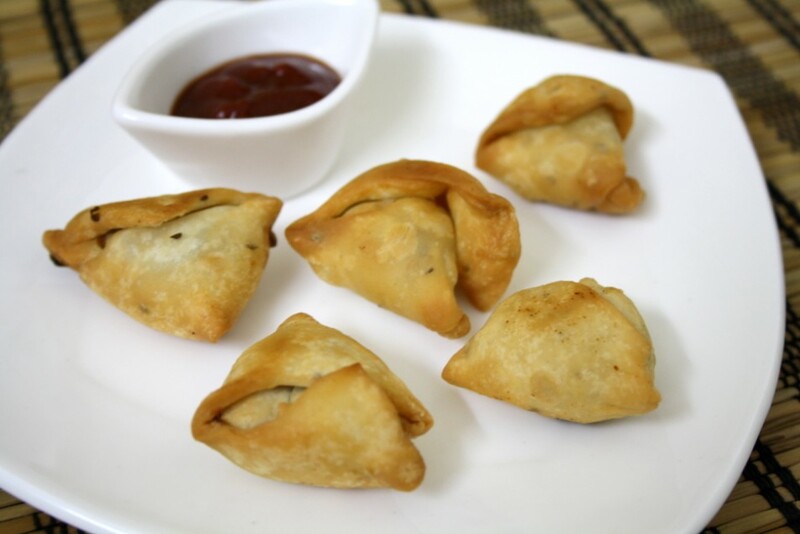 cute looking mini samosas! love the filling too! I need just one srivalli…. My today's post was unplanned too. I had listed a few for the bm and my today's recipe was not on the list. Today being a weekend, the day started on a lazy note and then went to a movie in the afternoon. I ended up making a quick snack for dinner, which became my day 3 post, as we wanted to eat light. Valli…these samosas look absolutely gorgeous…n infact my mouth is waterring….since i m a samosa fan..n the onion suffing sound interesting!! My God,I loved them.what a selection of spices there..Will try ! 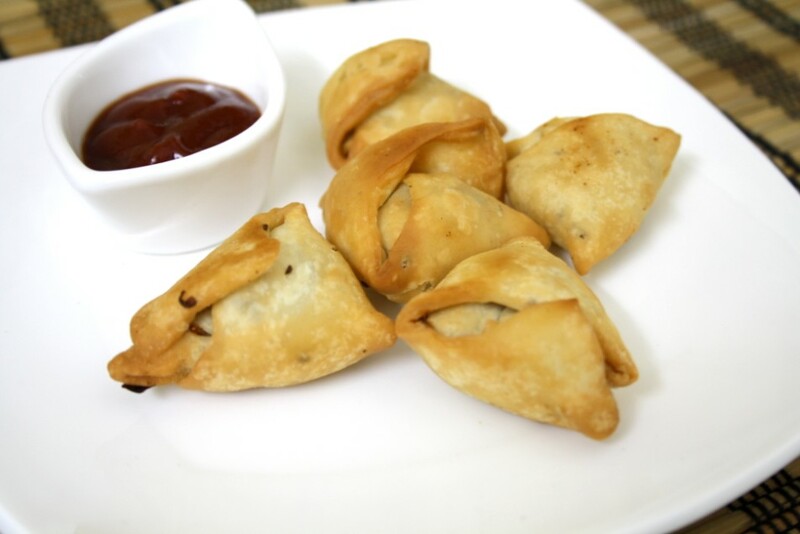 Love these bite sized samosas, Valli…..but I disagree with you on having better control while eating these. I think it is so easy to forget numbers and just keep munching on these. 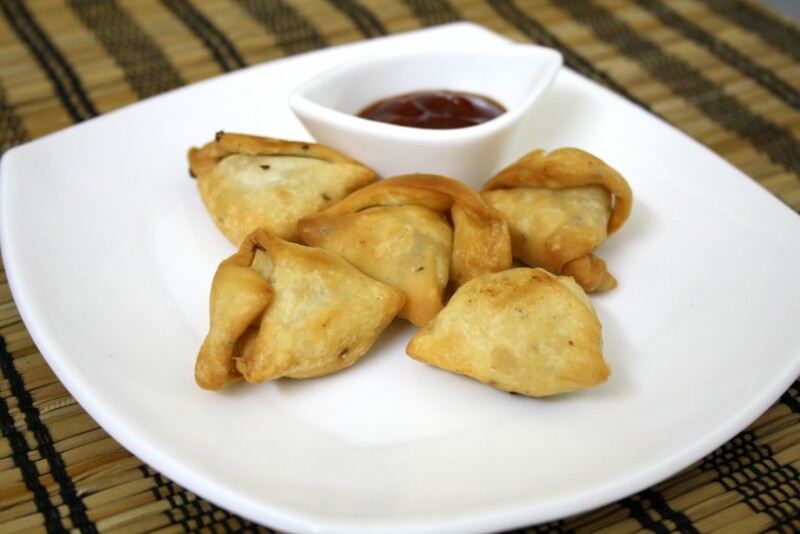 Those samosas looks sooo cute and addictive.. So cute. @as Jayshree says,these are really addictive. In my college days we used to eat a lot of them without control..